Blackheads are a type of acne called comedo, where pores in the skin get clogged with dead skin and oil. Infected blackheads result when you attempt to touch, squeeze, pinch, or pop a blackhead. In other cases, infections form when the blackhead is left untreated. It may be tempting to pop them. However, infected blackheads can often be very painful, and squeezing them will force aggressive bacteria and dirt into your pore, which can increase the time it takes for it to heal. That being said, infected blackhead treatment is possible with regular skin hygiene maintenance and natural home remedies like witch hazel or essential oils. Read on to learn more about the causes, symptoms, treatments, and home remedies for infected blackheads. Blackheads can arise at any age, and can be triggered by stress, high humidity, grease, heavy sweating, and issues related to women such as premenstrual syndrome (PMS), polycystic ovarian syndrome (PCOS), pregnancy, and the use of birth control pills. What are the most common causes of infected blackheads? When you disturb blackhead pimples, the ordinarily harmless bacteria present on your skin accumulate in the open pore and produce an infected blackhead. This will lead to redness, inflammation, and swelling of the infected area. Squeezing or popping can also lead to infected blackheads, and often results in the aforementioned bacteria and dirt getting trapped in the skin. This is especially true when you squeeze the blackhead with dirty hands. If you squeeze blackheads before they have fully matured, there is a chance the infection may spread to the blood and surgery may be required. Poor hygiene is not a direct cause of blackheads, according to experts. But whether intentional or accidental, the more you touch your face, the more likely you are to trigger the infection of those blackheads. Using topical products that dry out the skin will only lead to more oil, which increases the risk of blackheads. Without proper hand and facial hygiene, the infected blackheads may turn into something more serious. When the skin gets irritated, this can lead to infected blackheads. Scrubbing can remove the skin’s natural sebum, and can lead to skin blockages and further inflammation. Face masks, removal strips, and vacuums can also irritate and damage the skin when used incorrectly. Blackheads can develop on any part of the body. It is not uncommon to find an infected blackhead on nose, lip, forehead, or cheek areas. However, an infected blackhead on the back, legs, or hands can also be a problem. An infected blackhead in the ear canal is also common, and the infection can spread to other parts of the ear when scratched roughly. Swelling: Infected blackheads grow larger and swell, especially on sensitive parts of the body like the face. Tenderness: The area around an infected blackhead can feel soft to the touch and tender, likely due to the fluid inside the blackhead. Redness: The infected blackhead is often pinkish red, while the area around the blackhead turns pink. The redness intensifies when touched. When blackheads on the face turn red, it’s often the first sign of an infected blackhead. Warmth: Infected blackheads will feel warm to the touch due to high blood circulation in the area, which in turn helps progress faster healing. Pain and inflammation: A sharp pain is experienced when an infected blackhead is touched, especially when the blackhead is on the ear because the area is quite sensitive. Pus: Pus forms in inside the swollen, infected blackhead. Depending on the cause of the infection, the color of the pus can be white or green. The pus keeps accumulating and grows until the blackhead opens up. Bleeding: When an infected blackhead breaks open, pus will drain out, and some blood also comes out with it. You have an infected blackhead on the nose or on another part of the body. What do you do? Isotretinoin-based treatment with brands like “Accutane” is the standard conventional acne treatment; however, it can lead to several serious side effects, such as depression, bowel disease, night blindness, psychosis, and even suicide. Some people may also use the antibacterial benzoyl peroxide skin cream to treat blackheads, but irritating side effects may include dry and peeling skin, chest tightness, breathing difficulties, hives, and excessive burning pains. Other standard treatments like salicylic acid and antibiotics may also further exacerbate infected blackheads. As a result, the ideal approach to an infected blackhead treatment may be a natural one. Infected blackhead removal can be simple with the following natural treatment methods. Regular exfoliation and cleansing is an obvious approach for an acne-free body and face. Cleanse with soaps that include plant-based ingredients like olive oil. Effective natural exfoliants include Manuka honey or baking soda. Although science has not found a direct link between a poor diet and blackheads, a healthy diet is essential for reducing inflammation and promoting overall good health. That is why it is a good idea to remove certain inflammatory triggers from the diet, such as wheat and gluten, sugar, chocolate, fried and fast foods, hydrogenated oils, and dairy. Instead, eat a plant-based diet rich in probiotics, fiber, omega-3, zinc, vitamin A, and vitamin C.
A weekly bentonite clay or charcoal mask can help clean the pores, pull out blackheads, and leave skin smoother and less oily than before. Pore strips are a visible way to remove blackheads. However, avoid daily usage. They are only meant for use once every three days, or once weekly. Fill a large bowl with boiling hot water. Let the bowl cool down before covering your head with a towel and leaning over the bowl for five to 10 minutes. Do not get too close or you will risk burning yourself. When done right, the steam will help loosen blackheads. Afterwards, wash the face with cleanser and warm water and dry the skin. Repeat once weekly. Skin brushes are deep-cleansing exfoliators that work as an effective part of a daily routine for blackhead removal. Still, make sure you keep your brush clean and replace the brush heads often to avoid the accumulation of bacteria. There are also a number of natural home remedies you can use for infected blackheads. Let’s take a closer look at several of them. Coconut oil is among the best skin moisturizers available. Research shows that the lauric acid in coconut oil is the key effective ingredient against acne due to its antibacterial properties. All you have to do is take a little coconut oil and rub it onto the skin. Baking soda is an effective and cheap skin exfoliant that helps drain pus from the blackheads and reduces the risk of infection. Combine a teaspoon of baking soda with a half cup of water, and rub it onto the face in a circular motion before rinsing. Witch hazel is a blackhead treatment capable of reducing bacterial growth, inflammation, and excessive oil production. Witch hazel also reduces the look of pores while stopping the development of blackheads altogether. Use a few drops of witch hazel as a toner after washing your face. A homemade honey and tea tree (melaleuca) oil mixture may do wonders to cleanse the skin when used in the morning, evening, and after workouts. For the recipe, simply combine one tablespoon of melted coconut oil, three tablespoons of honey, one tablespoon of apple cider vinegar, two capsules of live probiotics, and 20 drops of melaleuca essential oil. Pour into a bottle and store in a cool area. Essential oils in general are excellent for natural blackhead treatment. In addition to tea tree oil, other essential oils used for acne include rosemary, clary sage, juniper berry, frankincense, and lavender. Apply a few drops of essential oil undiluted directly onto blackheads as an overnight natural treatment. For very sensitive skin, combine a few drops of essential oil with carrier oils like avocado oil or jojoba oil. Applying a warm compress to blackheads can help increase the skin’s blood flow, which also decreases inflammation and pain. A cold compress like cold tea bags can also reduce pain while also moisturizing and rejuvenating the skin. Infected blackheads result when you squeeze, pinch, touch, or pop them. They also occur when blackheads are left untreated. That is why it is important to treat your blackheads naturally. In this article, we detailed some of the better options for natural infected blackhead treatment. Infected blackhead removal can be simple with a natural cleansing and exfoliating regimen, as well as with skin brushing, steaming with warm water, and using pore strips and clay and charcoal masks on a weekly basis. It is also important to implement a natural, plant-based diet with key nutrients like zinc and vitamin A, and without processed foods or other food triggers like sugar or wheat. When it comes to home remedies, it is also a good idea to consider a warm or cold compress, coconut oil moisturizer, baking soda exfoliant, witch hazel cleanser, honey and tea tree oil face wash, and other essential oil treatment. 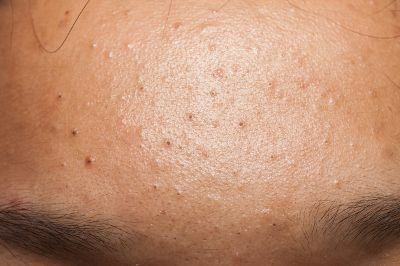 Felman, A., “Everything you need to know about blackheads,” Medical News Today; https://www.medicalnewstoday.com/articles/71615.php, last updated July 27, 2017. “How to Get Rid of Blackheads,” Dr. Axe; https://draxe.com/how-to-get-rid-of-blackheads/, last accessed Jan. 15, 2018. “How to Get Rid of Pimples,” Dr. Axe; https://draxe.com/how-to-get-rid-of-pimples/, last accessed Jan. 15, 2018. “Homemade Honey Face Wash for Clear Skin,” Dr. Axe; https://draxe.com/homemade-honey-face-wash-clear-skin/, last accessed Jan. 15, 2018. Yang, D., “The antimicrobial activity of liposomal lauric acids against Propionibacterium acnes,” Biomaterials, Oct. 2009; 30(30): 6035-6040, doi: 10.1016/j.biomaterials.2009.07.033.